Enjoy the non destructive grade music and your ride! The perfect match for the installation size. A:Custom fit genuine switch style,size perfectly matches. B:Connected to dashboard light,led color matches to original switch. C:Connection succeed with a single click,bypass the complication of password matching. D:Self-programming technical, supports nondestructive sound transmission,zero noise,and high acoustic quality. E:Touch screen, easy to use. F:Privacy call function,phone call transfers to cellphone,voice returns to media when hangup.No conflict with car bluetooth. 3:Mount into place with buckles behind locked. 4.Enjoy the non destructive grade music and your ride! 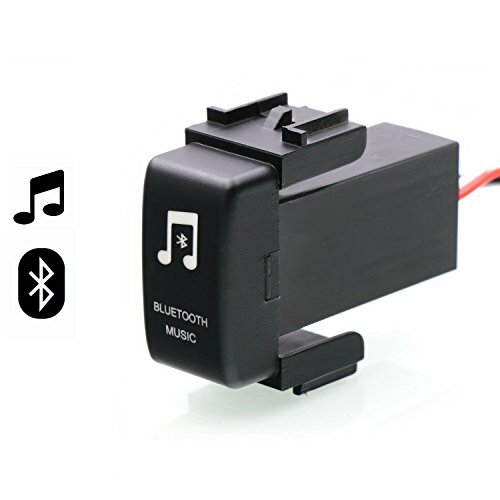 【Wide Compatibility】- Built with Bluetooth 4.0,you can enjoy music from your smartphone in premium-quality sound.Support Smartphone, Android, Apple iPhone,Tablets, other media players, and more! 【Easy to Use】- Touch switch, you can connect to Bluetooth without using a password. 【Privacy Protection】- This Bluetooth adapter does not receive phone calls.Voice returns to media when hangup.No conflict with car bluetooth. 【Perfect Match】- Directly installed in the car's reserved switch position,very easy to install. 【1 Year Manufacturer's Warranty】- We strongly recommend that you measure your mounting hole dimensions before purchasing. If you have any questions about this product by Timloon, contact us by completing and submitting the form below. If you are looking for a specif part number, please include it with your message.